When I first saw the trailer for Unstoppable, I knew I was going to be in for a wild ride. But, I was ready with popcorn in one hand and my Coke in the other. 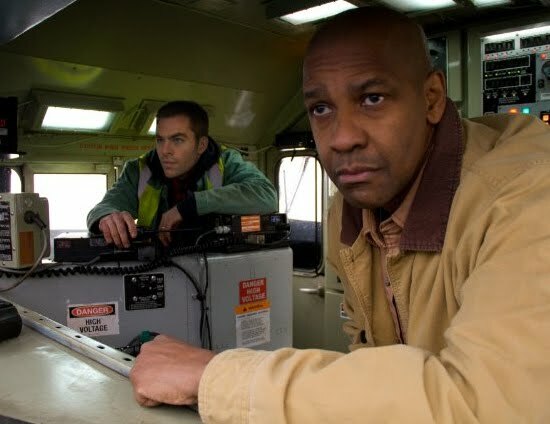 Ripped from the headlines in Ohio back in 2001, the story unfolds as we meet 28 year railroad veteran Frank Barnes (Denzel Washington) starting his shift with a new trainee, Will Colson (Chris Pine). It seems Will comes from a long line of family trainmen, so the feeling among the men is not a favorable one. Will doesn't expect special treatment because of his family name, but there's still that friction amongst the co-workers. The problem starts when a young engineer loses his common sense (a better term is being stupid on the job) when moving engine number 777 off of a particular track that will be used later on. A simple mistake causes the train to run unmanned at a high rate of speed towards small towns and eventually a large populated city. Several obstacles come into play and one of those is a train full of young kids out on a field trip learning the safety of the railroad. How apropos. The train company seems to think their main concern is how much money they will lose if they don't stop the runaway train as opposed to how many lives that could be lost. Many attempts at slowing the train are not having the impact the yard master assumed. They are running out of ideas except for the most costly one of derailing the train, even though it's carrying cars of explosive and flammable liquids. Meanwhile, Frank and Will realize they are on a head-on collision course with said train and decide they want to take on the responsibility of trying to stop it. With the help of Connie Hooper (Rosario Dawson), the control board operator who befriends them, they put their heads together for a reasonable solution to this ordeal. Will their plans work or will the fatalities be aired live on television as the events unfold? The action scenes are intense, to say the least. So much for the popcorn and soda in hand. I was busy either chewing my nails or gripping the arm rest. Failed attempt after failed attempt, I just couldn't imagine how that train was going to be stopped or slowed down before it hit a crucial turn in the middle of the populated city, where fatalities were sure to occur. If you want to take a ride on the wild side, see Unstoppable for some heavy duty action sequences and suspense. I'd give it 4 out of 5 miles of track.